A thrilling finish at Pontefract last season. Picture: Alan Wright. 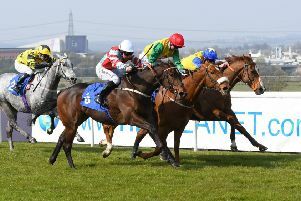 Pontefract racecourse’s new season starts with a quality meeting next Tuesday, April 5. With over £60,000 prize money on offer, the card often throws up some impressive early season types. The highlight of the programme is the £20,000 Watch Racing UK on 3 Devices Handicap over one mile, two furlongs. While it doesn’t have the same monetary value, the one mile, two furlong EBF Maiden has a rich roll of honour. Luca Cumani’s High-Rise won this race on his way to victory in the Epsom Derby and lends his name to this race. While other winners of this race have gone on to go close in the Derby, including Libertarian in 2013, High-Rise remains the only one currently to complete the double. Sprinters step to the fore in the £12,000 Racing UK Handicap over six furlongs. Pontefract’s leading trainer in 2015 Richard Fahey provided the winner last year as his Grandad’s World maintained his unbeaten record at Pontefract. Of all the races run over the years at Pontefract, the stayers races evoke the strongest memories among the race going public. With course favourites like Dan Buoy, Jamaican Flight and Bluff Cove all laden with stamina, the Stayers Championship has proved a popular addition to the racing programme in recent seasons. Round one of the 2016 championship gets underway with the Jamaican Flight Handicap over two miles, two furlongs. The 2015 series champion Tuscan Gold kicked off his campaign with a third place in the corresponding race last year and he’ll hopefully be back to defend his crown along with another previous winner Riptide.